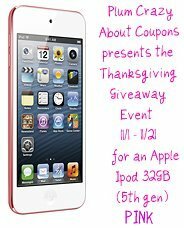 Apple® - iPod touch® 32GB MP3 Player (5th Generation - Latest Model) - Pink. RV $299.99. This will be a hot item for Christmas!! They are taking pre orders right now and expect to be out this month. Giveaway will run Nov. 1 - Nov. 21. Winner will be chosen on Thanksgiving.